This handy, compact and portable cheese melter is fueled by tea lights. For those with a soft spot for fromage, it's okay to get a little cheesy now and then. 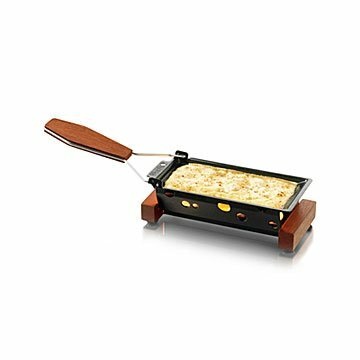 With this portable melter, you can transform your favorite cheese into melty magnificence in just four minutes with the heat of three tea lights. Use the included mini-spatula to scoop the melted cheese onto crostini or crackers. The tray and heating base fold up for compact storage and picnic portability, and the base is perforated with a pattern of Swiss cheese holes for a touch of whimsy. The solid sapele wood and metal construction make this tempting tool a lasting addition to your cheese accoutrements. sapele wood sourced from Germany; assembled in Taiwan. Bleeker created a collection of rural-inspired products that evoke feelings of warmth, gathering around a table and times shared with friends. "Gezellig" is a Dutch word that translates to mean "having a warm or friendly atmosphere", "cozy and comfortable". Bleeker kept this in mind when developing the Life Collection by using materials with a natural look, including pastels with a soft grey tone, earthenware, concrete, and European White Oak. I haven't had a chance to use it yet, but I'm sure it will be just what I need! This is a great size for someone who loves fondue but lives alone. Safe to use. Lightweight but sturdy/solid. bought it for my son and he is not a fan. We ordered some of it's namesake "raclette cheese". It melted perfectly in the tray. I love the nonstick quality of it. I told my husband, I wish I had a pan made out of this material. Even though I love to cook, it's nice to have a simple solution to a tasty meal. We toasted bread and roasted cauliflower. We used up all the cheese we had in the fridge. My friend has an insane love for cheese... what else would you get a cheese lover for her birthday?! My friends will use this to cook. We use it to pour over vegetables/meals. Easy and I love how small it is because it makes it easy to take to a friends house or outside.